I have a pair of slippers like that at home. tsk tsk. this is hilarious! some shoes just love to do that! 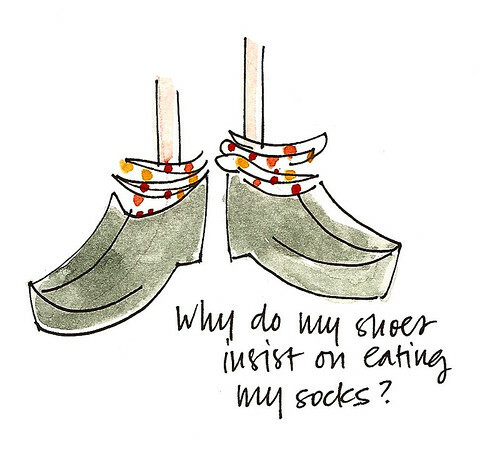 I think it's because your socks are so darned yummy looking! What great socks. I have sock envy!! I have a pair of boots that do the same thing! lol. I always blame the socks. Maybe it's just this particular combination of socks and shoes. They don't play well with each other? Very cute! they are like siblings! they don't ask to get tossed together, but it must happen, so it's inevitable that they get into tussles with each other once in a while. i wish i knew why my kids insisted on stuffing my shoes and boots with foreign objects. i've found everything from fisher price little people to CDs in my footwear. aahh, it's mostly my boots who do that.